The Ministry of Works’ intention in 1951 was to build new offices and residence at the Porta Pia site so as to be able to sell the Wolkonsky estate as soon as possible. Most, but not quite all, of the succession of ambassadors wanted, however, to retain their residence in the Villa Wolkonsky. The Ministry of Works already had much too much work on its plate to devote sufficient time to Rome. The Foreign Office saw that playing for time was its best strategy, arguing convincingly that many Posts in the world had much worse and more pressing problems than Rome. Significant uncertainties also pervaded the endless debates: particularly about how much capital the Treasury could make available to spend, and about how much the sites were actually worth, given that both were designated parco privato vincolato and therefore potentially immune from development. Sir Edward Muir, Permanent Secretary at the Ministry of Works, chaired a meeting with the Foreign Office in April 1954 which concluded that Porta Pia offered the opportunity for a fine building but would need additional development to justify its retention. The Foreign Office definitively stated, for the first time, that the residence at Villa Wolkonsky should be regarded as permanent. A 1954 Select Committee on Estimates optimistically supported building offices at Villa Wolkonsky. Around this time, the idea surfaced in a Parliamentary Committee that a commercial development partner should be sought with whom the Ministry might jointly develop the site. After discreet but widespread enquiries, the partner selected in 1954 was Cidonio and Co., a leading contractor, who intended to build on ‘his’ half an hotel to be open in time for the 1960 Olympic Games. Plans for the two buildings were separately developed: in-house by the Ministry of Works for the embassy building and by Luccichenti and Monaco for Cidonio’s eight storey hotel. The mayor of Rome reminded the ambassador in mid-1955 that the Comune (Municipality) believed it was entitled to expropriate the Porta Pia site for a public park and might not hesitate to do so if it did not like the proposals being formulated. In April 1956, the ambassador, Sir Ashley Clarke, submitted the equivalent of a planning application for embassy offices and Cidonio’s hotel to the Ministry of Foreign Affairs. Some suggestions for changes were made several months later and accepted by the ambassador in a note of May 1957, which brought no response. More than a year later, the Ministry of Works and Cidonio agreed to tell the Ministry of Foreign Affairs that they would abandon the scheme if permission for it had not been granted by the end of November 1958. Silence ensued. Socialist members of the Municipal Planning Committee wanted the British to be offered a site on the outskirts of Rome and the Porta Pia site to become a public garden. The deadline passed and the embassy formally withdrew its application in a note of February 1959. The demise of the Cidonio partnership proposals returned the sites debate to where it had been in 1955. Muir chaired a meeting in September 1958 of the ambassador, Foreign Office, Treasury and Ministry of Works staff to discuss the future of the two sites. He proposed that the right course was now to build the offices at Porta Pia and accept that a residence might be added at a later date. The Foreign Office was adamant about keeping the residence at Wolkonsky, and opposed various proposals put forward by the Ministry of Works (unrealistically, as it transpired) for building some staff flats at Villa Wolkonsky: in the Foreign Office view, it would make more sense to build staff flats at Porta Pia. In December 1958, Muir instructed that a start be made on the design for embassy offices on Porta Pia, and that it should be commissioned from a major private architect. He was firmly supported by the Minister of Works, Hugh Molson, who had lost faith in his Ministry’s in-house architects. Molson additionally insisted that the layout be planned to allow building a residence on the same site later. During 1959, it became accepted that this stipulation be modified to permit the building of some UK staff accommodation, instead of a residence, on the non-office portion of the site. The surrender to the Comune of a strip of land along the west side of the site so as to open up views of the Porta Pia was also agreed. Basil Spence was an obvious choice for the architect, and he was gradually brought into the picture. No announcement about his selection was made at the time but Spence was evidently advising the Ministry privately during 1959 and 1960 while the office accommodation requirements were being thrashed out with the Treasury. The eventual design brief called for embassy offices and residential accommodation for fourteen UK staff and their families on the whole of the Porta Pia site. 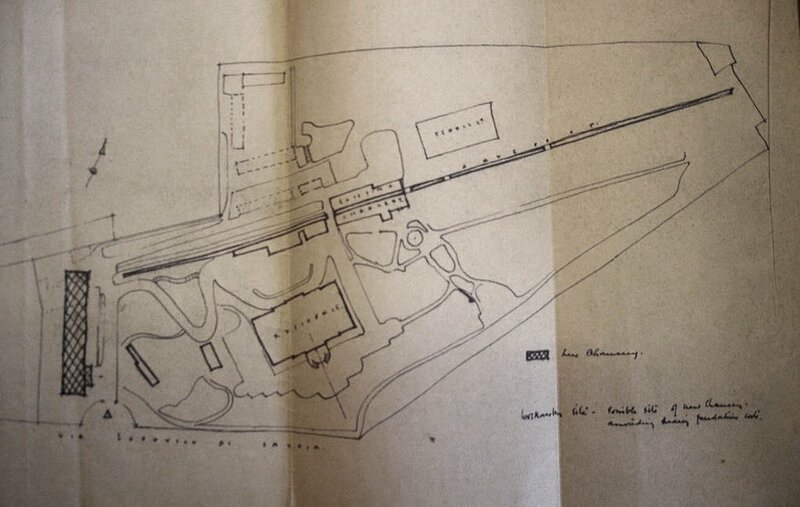 Sketch by Eric Bedford, MoW chief architect, of an idea for developing the Porta Pia site, 1954. 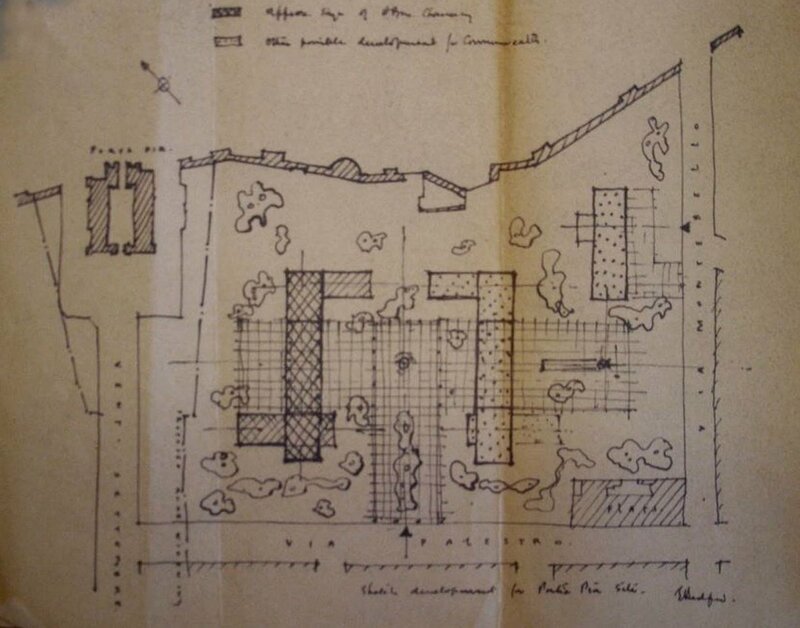 Sketch by Eric Bedford to show where a chancery building might be sited at Villa Wolkonsky, 1954. By the time that he was formally commissioned in November 1960, Spence was well on his way to finalising his design concept: drawings dated December 1960 show all of the main characteristics of the completed embassy offices building in place. His design was formally accepted in London and Rome during 1962 and he started on working drawings in 1963. The mid-1960s were a period of severe public expenditure restraint and balance of payments difficulties and the scheme was effectively put on ice until the Treasury gave its approval to proceed in 1967, on the express condition that the Villa Wolkonsky estate would be sold when the offices vacated it. There was, at one stage, the glimmer of a chance that the German embassy might be interested in purchasing its former home but that came to nothing. In 1966, during one of several exercises to reduce the cost of the scheme, the proposed block of fourteen UK staff flats at Porta Pia was excised. This re-opened the possibility of building a residence here later. The Ministry of Public Building and Works (MPBW), as the Ministry of Works became in 1962, began preparing for the sale of Villa Wolkonsky by making enquiries about what development potential the estate might hold and how it might be sub-divided for sale or partial retention. It also advertised for a new residence to buy or to lease. This produced only one house worthy of serious consideration: Villa Caligiuri, 15 Via Mangili, on the corner with Via Cancani, but it had almost no garden and was very hemmed in. All these approaches proved fruitless. It therefore became clear that Villa Wolkonsky could not be sold for more than its existing use value (in other words, any commercial development was a non-starter) nor before an alternative residence was built at Porta Pia. The ambassador, Sir Evelyn Shuckburgh, wrote to the FCO in September 1968 ‘that from the end of 1970 we shall be wasting money on a prodigious scale’ by leaving half of Porta Pia vacant and not selling Villa Wolkonsky. To force the pace, the Treasury in 1970 approved the construction of a new residence at Porta Pia despite the FCO’s forceful view that its necessary representational standards could not be maintained at a modern house, especially at a time when Britain was joining the European Economic Community. Spence infuriated many of the Ministry staff over the years by being over-bearing, fussy and difficult to work with. There had therefore been little enthusiasm for appointing him, when the opportunity first arose in 1967, as the architect for the residence that might be built on the eastern part of the Porta Pia site. In the event, no progress was made at that time because no agreement could be reached on the size that the residence should be. In mid-1970, the Treasury authorised a planning start on a residence of not more than 8,500 square feet at an estimated cost of £180,000, the cost to be financed by the sale of the Wolkonsky site. 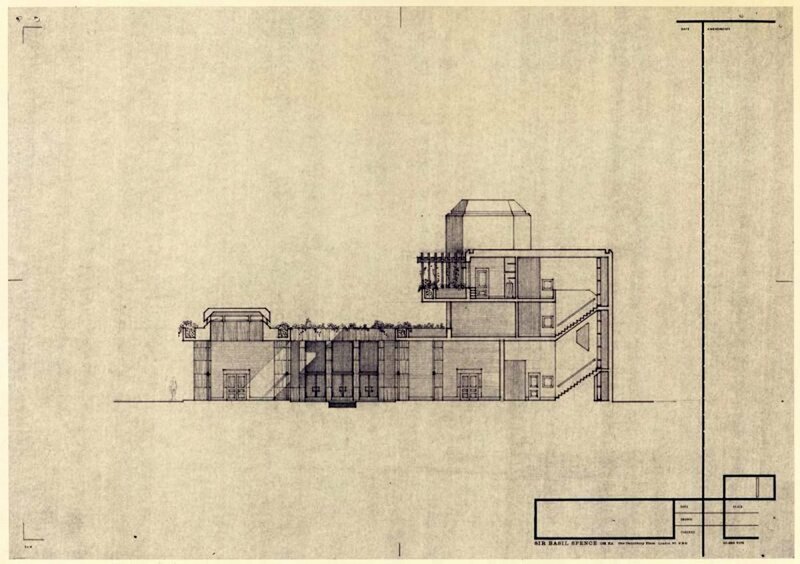 Spence was asked, against the judgement of some, in January 1971 whether he would be willing to undertake the design and execution of this smallish residence on a tight budget. His acceptance was not a surprise: he had apparently told the Foreign Secretary that he would be prepared to waive his fee in order to keep costs down. 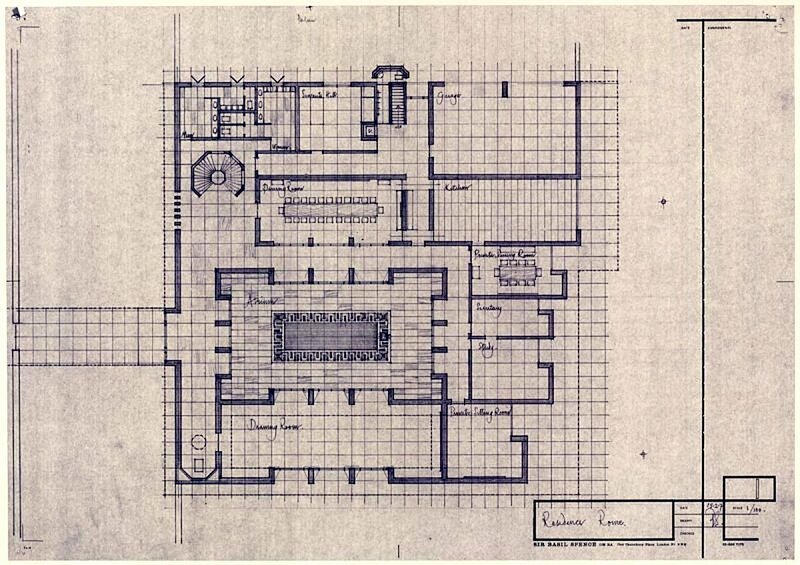 Spence subsequently produced an elegant atrium design for a relatively modest residence. The grade of the ambassador was then raised, which necessitated a larger residence. Spence was confident that his concept was right enough, and the site large enough, to cope with a larger residence and still retain the proportions which he thought vital. But the (Conservative) Minister of Works, Julian Amery, was by then having second thoughts about selling Villa Wolkonsky and instructed Spence, when both were in Rome for the opening of the office building, that he should do no further work on any residence scheme until he had received a revised brief. None was ever issued, to Spence or to anyone else. Amery told the Foreign Secretary, Sir Alec Douglas-Home, that the Porta Pia site was simply not big enough to take the kind of residence needed in Rome. He had taken it upon himself, without seeking any further enquiry or support, to opine with force that the east half of Porta Pia was too small for a residence of the necessary quality and that, in consequence, Villa Wolkonsky should be retained. In 1973, the Property Services Agency (a successor of the Ministry of Works) and the FCO agreed a rationale for the status quo. The Treasury objected, maintaining that ‘a purpose-built residence, designed to a high standard and complementing the splendid Spence Chancery, would be entirely consistent with the image we are trying to foster in Europe’. All parties were by then tired of wrestling with Rome, and the impasse lasted throughout the 1970s and was re-affirmed in 1981. It lasts to this day. 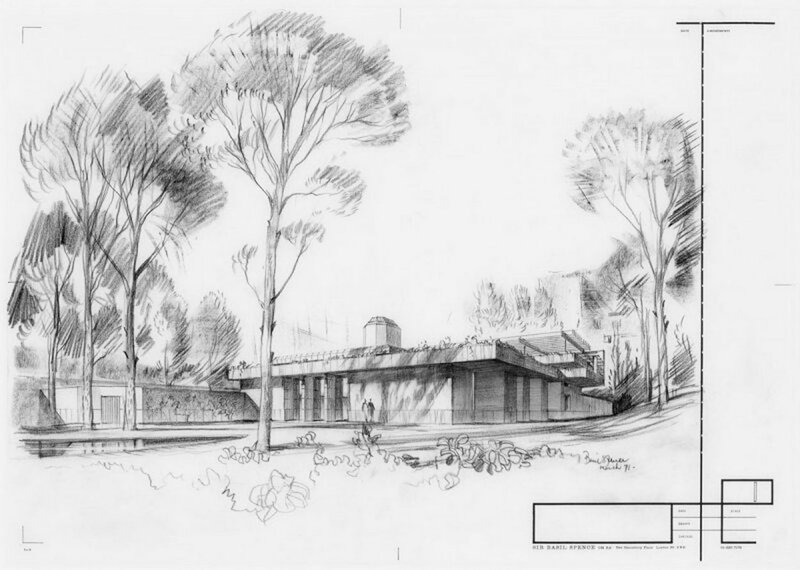 Perspective sketch by Basil Spence of small residence, March 1971. 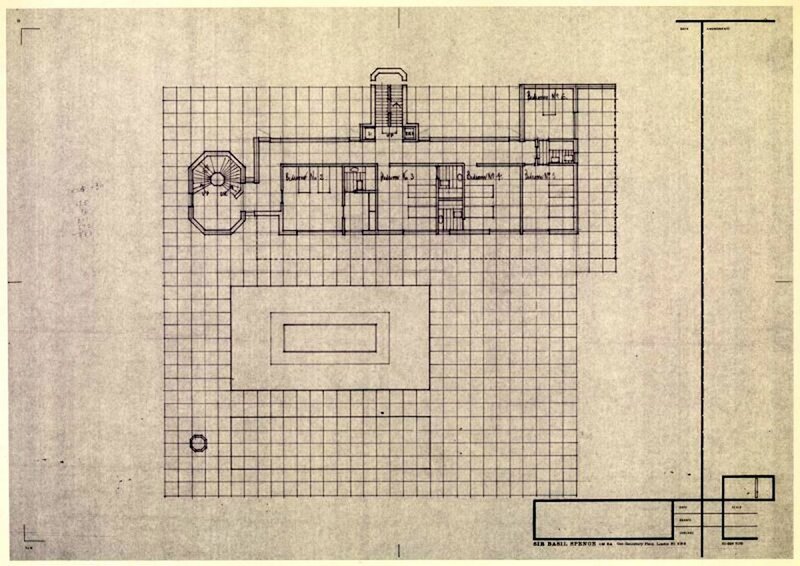 Floor plan of Spence’s proposed small residence (to dine 24), February 1971. There is an atrium in the middle, flanked by drawing and dining rooms. The private quarter is on the right and services at the top. First floor, containing bedrooms 2-6. The master suite occupied the second floor. Side elevation of the proposed small residence. 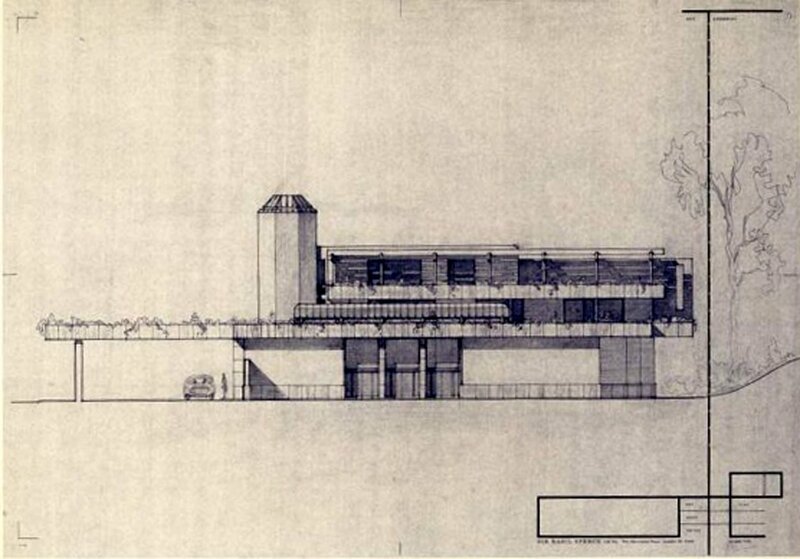 Section of the proposed residence, 1971.